“Make your own trail mix! Peanuts, pistachios, goldfish, pretzels. Cranberries, peanut butter chips and m&m’s oh my!” Emily’s gang! My great aunt Mimi lived in Manitowoc Wisconsin, and while she lived a long way from her brother, and nieces and nephews, she made it a point to keep in touch. She never married, and never left the house she grew up in, except while she was in college. She became a lawyer and worked in Green Bay but commuted from Manitowoc. I have a lot of stories to tell about Mimi, but for the sake of brevity, I am going to skim over the historical parts of our family history and just tell you the trail mix story. Every year for Christmas, Mimi would send her nieces and nephews a cheese gift box from Mars’ Cheese Castle. You know those gift packages where there is never enough cheese to do much with, and most of it is vintage, but not in a good way. Because I made an effort to stay in touch with Mimi and eventually moved to Chicago where I could visit her fairly often, she added me to her Christmas gift list as an adult. But unlike my mom and her siblings who received cheese boxes, she sent me tins of trail mix. Naturally, I would write Mimi a thank you note for the delicious trail mix and the lovely tin, but over the years, I became downright hostile about the god awful stale trail mix and dented ugly tin. I always suspected that Mimi ordered enough cheese boxes to be rewarded with a free tin of trail mix, which she re-gifted to me. One year, Mimi asked me to help with her with her Christmas ordering, which I did, and of course, I substituted a chunk of cheddar cheese for the trail mix. If this is taking advantage of the elderly, I plead guilty as charged. After 15 years of trail mix, I saw an opportunity to upgrade, and I took it without a moment’s worth of guilt. When the box arrived on my door step a few weeks later, I tore into it, feeling such Christmas Joy . . . and then I saw it — the ugly tin of trail mix. Some sharp employee caught the mistake, notified Mimi (she was a good customer and received personal attention), and the mistake was fixed. Joe and my mother were so amused. Joe and my mom had a love/hate relationship — the love part of the relationship was usually at my expense. When Mimi passed (God rest her soul), one of my first thoughts was that I would not have to face that ugly tin of trail mix at Christmas ever again; I didn’t feel bad about having that thought. Twenty years of trail mix had made me callous. Christmas arrived. I went to the mail box and there was a box with a Wisconsin return address. Odd. I opened it . . . and inside was trail mix. Mimi had been dead nine months! I called my mom, hysterical. She told me she had also received her cheese box, and reminded me that Mimi always placed her orders very early. That made sense. A year went by, and like it always does, Christmas arrived. I went to the mail box and there was a box with a Wisconsin return address. I shook the box, opened it, and screamed. More trail mix! I called my mom. She did not receive her cheese box, but wondered if I was on the perpetual trail mix plan. I was horrified! When I showed the tin to Joe, he immediately thought my mom was guilty of stalking me with trail mix. I defended my mom, who I believed was much too frugal (cheap) to actually order me something I hated. I began to worry that the evil Catholic nuns from The Bridge Between that scammed over $50,000 from my aunt’s bank account before I servered the relationship between their retreat center and Mimi’s bank account were stalking me . . . they had done other scary things, so my fears were not totally unfounded. Joe was still very suspicious of my mother. I looked at Joe and asked what kind of mom would let their daughter believe they are being stalked by evil nuns with tins of trail mix. Joe looked at me hard. Then, it dawned on me . . .
My mom was not beyond letting me believe that I was being stalked by the evil nuns. In fact, that would amuse her greatly and be worth the price of trail mix and shipping. She said she would get even with me one day for not giving her my turquoise sandals. My mother claimed indignation, innocence, and shock that I would suspect my own mother of such a thing, and she insisted that my evidence was purely circumstantial. 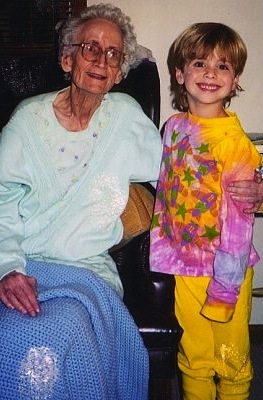 I would like to believe her, but I could hear Mimi’s laughter all the way from heaven. My family is Odder than your family . . . Even on Trail Mix Day, I don’t eat trail mix, but it was also “Eat Outside Day, so Cole and I had lunch on the patio of a neighborhood restaurant. 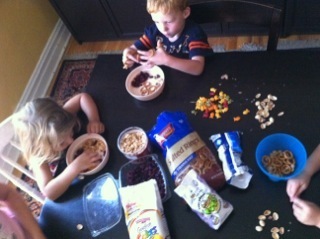 Emily went the whole nine yards and let her kids make trail mix (see picture at top of post). I am little behind on my musing but will be back soon to muse about Cherry Popovers and Wine! I hope you will leave a comment-musing with you is so much fun! So funny! How did your mom pull it off? I’m not sure..she still denies it was her! Perhaps she will tell me on her death bed but I doubt it. So many of your muse’s have me laughing out-loud. You tell a great story and it seems your mother has provided you with a great deal of material. 😀 my mom is my best material…thank God she does not have a blog…!! Glad I amuse! Thanks for stopping by Odd. I only like the M & M’s in trail mix. Great story! If there was a best part to trail mix it would be the M&M’s but guess what…my trail mix did not have M&M’s. So…. Do you still receive Trail Mix for Christmas? SO guilty. And I believe your sister had a hand in it, too.